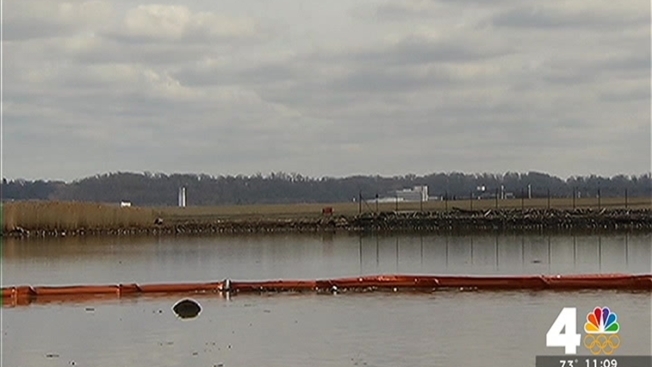 Officials are conducting a dye-tracer test Thursday to try to determine the cause of the Potomac river mineral leak. 13,500 gallons of mineral oil leaked into the Potomac River earlier this year, killing 21 birds, mostly Canada geese. The waters of a wildlife refuge in Northern Virginia may turn a bright peach color as officials do a dye-tracer test to try to determine how mineral oil leaked from a Dominion Virginia Resources substation into the Potomac River earlier this year. The Washington Post reported officials are conducting the test Thursday. It was ordered by the Virginia Department of Environmental Quality. Dominion spokesman Charles Penn says the dye is nontoxic. The dye may be visible between the Crystal City substation and Roaches Run Waterfowl Sanctuary. A transformer failure Jan. 24 resulted in the leak of 13,500 gallons of mineral oil. An unknown amount spread into the sanctuary and the river. Twenty-one birds, mostly Canada geese, died after the oil coated their feathers.